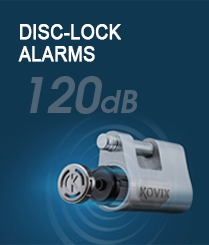 For more than a decade, KOVIX have been designing and manufacturing a wide range of intelligent security locks for home and vehicles. Combining our expertise and know-how with the latest technology, Kovix focus on the development of every product based on customer experience. This has led us to create one of our unique product features - the ON/OFF alarm selection for our alarm-equipped locks. In recent years, KOVIX have mastered the manufacturing of stainless steel products which helped to increase the number of locks passing the European SRA test. Worldwide, we have international business partners whom we help to design and supply security products. We are also specialized in designing unique security solution catered to our business partners’ needs. To our customers, KOVIX passion for creating intelligent locks will guarantee both your home and vehicle security.